Home DIY Projects	Outdoor Engagement Party! Happy Monday! My husband and I have been in warp speed this past week preparing for our son’s engagement party. After months of planning, it finally happened this past Saturday. 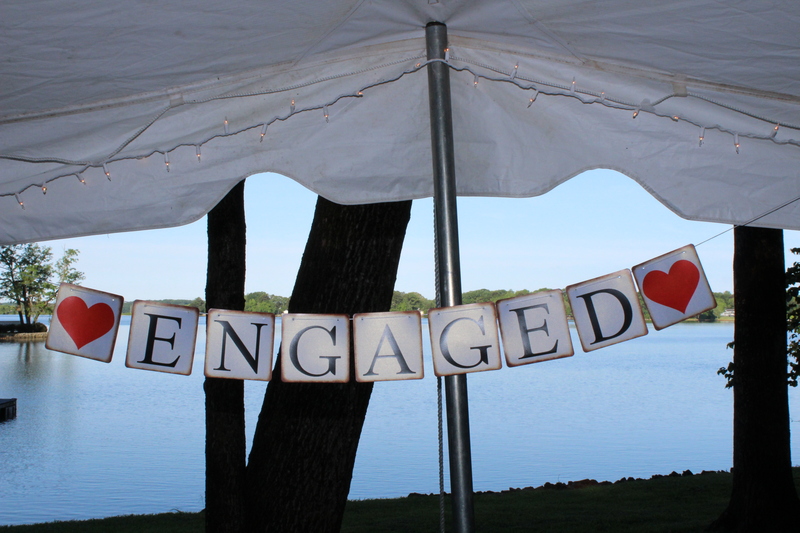 It was an outdoor engagement party at our lake house, aka Happy Hill! We rented the tent, four round 60″ tables and 48 chairs from a local company called Jump Start Party Rentals out of Mooresville, NC. They were so nice to work with! They delivered everything on Friday afternoon and left it until Monday. Jump Start set up everything which left us with plenty of time to decorate the tables and the tent. They also rent bounce houses, water slides and large outdoor toys. You can contact them at: www.JumpStartPartyNC.com. The tent fit perfectly over our patio and gave us a nice flat spot to put the tables and chairs. I bought some Christmas lights on sale after the holidays last year and we used those to line the inside of the tent. We used the white lights with white wire. There is a string that runs along the inside edge of the tent so we strung the lights along the string and secured it with clear tape. You can see the lights strung along the inside. We added a sign that says “Engaged” that I bought from Amazon. As a point of measure reference, one strand of 100 lights covered one side of a twenty foot tent. So, four strands of 100 lights will cover an entire tent this size. The plan was to hang a chandelier from the center of the tent and over the tables but the center post in the middle of the tent didn’t cooperate with my vision. (And there MUST be chandeliers.) So, we ended up hanging two of the chandeliers from the tree on the deck. I had the chandeliers put on a plug by an electrician & we hung the lights and then wrapped the cords around the back of the tree. This is not a very good picture but you get the idea. At night they were SO gorgeous! I admit the bugs loved the chandelier lights as much as I did but it was worth it. I forgot to snap a picture of the chandeliers at night, but I will! I insisted we leave the chandeliers in the tree for a while so we put a plastic trash bag around them to protect them from the weather. Night time pictures coming soon I hope! We decorated the tables with white scalloped tablecloths I found on eBay and fancy carved frame mirrors I bought at an estate sale earlier this year. On top of the mirrors we added photos of the engaged couple and a picture of each of them as a baby. My son’s Bottlechalk bottles held fresh flowers. We put stickers on the wine bottles that said fun things like, “Does this ring make me look engaged?” and “Love the Wine You’re with.” I found these on Amazon as well. A pack of four stickers was around $5.00. We put them on the table as decorations and at the bar. But wouldn’t these be cute as an engagement gift too? Maybe on a congratulatory bottle of champagne with some pretty ribbon? Hmmm…. I ordered some cute plastic cups from Zazzle with gold lettering that said “Love” celebrating Brie and Chase. We used these at the bar and to make a toast to the happy couple. I also ordered some personalized cocktail napkins that did NOT make it in time for the party. That was very disappointing but I had some other cute napkins that worked out fine. The timing was perfect and God blessed us with a beautiful day filled with love, family and friends. We are so blessed and look forward to the wedding this fall! The great thing about a long engagement is you get to spread the fun over several months and enjoy each event as it happens and culminates with the wedding. And so the countdown continues! Weights and Scales and Flowers…. Dell, I found your blogsite. I am thoroughly enjoying it. You did a great job with your engagement party. I would love to use some of your ideas someday if my children get married.